A number of people have sent me this video from Sky News Arabic, showing what they claim to be "AS-24 MANPADS", by which I assume they mean SA-24 MANPADS (Man-portable air-defense systems) , describing them as "heat seeking missiles"
From the "missiles" shown on the video we can see they don't belong to an SA-24, and weapon itself seems far too thick. 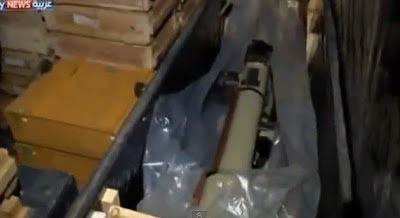 As I highlighted in this post about SA-7s in the hands of the opposition, SA series missile tubes tend to come in pairs in a very particular kind of crate, and the single weapon shown is in the wrong kind of crate. This appears to show the black strap and what I believe is the sight of the SPG-9, and in my mind clearly shows this is not an SA-24 as claimed. 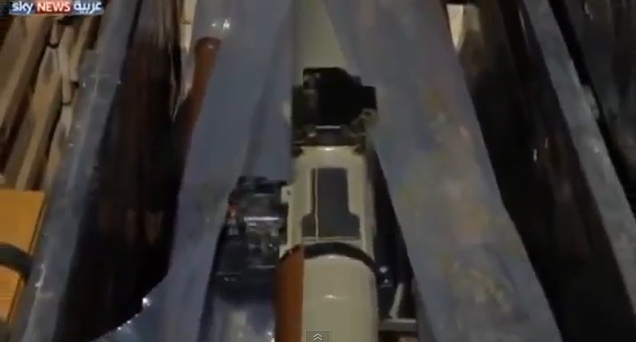 SPG-9s are now a fairly common sight in the conflict, in particular in and around Aleppo, so this sighting really isn't very exciting, and an SPG-9 is certainly no threat whatsoever to any aircraft. It's very important when reporting on weapon sightings in Syria to be sure of what you are actually seeing. The opposition often misidentifies weapons, be it accidentally through ignorance, or a purposeful attempt to deceive, and we've often seen L-39s described as MiGs, or a whole variety of small arms described as AK-47s. While this might not seem like a big issue it does confuse matters, and when the opposition gets their hands on a working SA-24 that's very significant, so it pays to be 100% sure. the people who are uploading these videos on youtube are normal people who has a mobile with a camera or a professional Camera in special cases! !